The combination padlock has had a fair workout in magic and mentalism, but never quite like this! PsyLock uses a 10 digit combination padlock which utilizes a set of unusual and clever principles and ruses to unlock a diverse range of routines. The performer never touches the lock before, during or after the routine in any of the routines. That's right - the performer NEVER has to touch the lock at all! Only one combination of numbers opens the PsyLock. Random combinations can be tested by the spectator at any time. 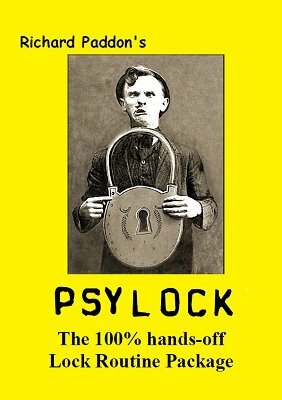 PsyLock is 100% hands off! The spectator has completely free choices throughout the routines. The PsyLock DVD featuring Richard Paddon and Sean Taylor, has around 90 minutes of detailed instruction, four complete routines and dozens of hints, tips and advice. ColourGram - The spectator uses their instincts and colour preferences to find the correct combination. Features a wonderful cold reading segment. StopLock - From a huge stack of cards with literally dozens of possible combinations, the spectator is able to instinctively discover the correct numbers to open the lock. BlindLock - A large bunch of combinations are placed blindly into a bag and mixed. The spectator draws a handful and narrows down to a single choice to successfully open the lock. The spectator has completely free choice. PsyVelopes - Drawing on a unique deception from Karl Fulves and Max Maven, the spectator selects from 10 number cards and 10 instruction cards to somehow find the correct instructions on how to open the lock. Sixty-page E-book with eight bonus routines for close-up, parlour and stage with dozens of ideas, resources, illustrations and colour photographs. Routines include the fabulous PsyLock Chair Test, MindLock and CrytsaLock. Presentations using cold reading with colours, trees, pets and symbols. Includes seven sample readings. All the files and templates to print the cards required for some routines. Information about the type of combination lock to use and where to obtain the lock and the perfect envelopes for the routines. A description of the PsyLock Chair Test - This is exactly how it plays: On a table are five black envelopes and a box locked with a padlock. Five chairs are arranged in a straight line across the stage. Six spectators are selected. Spectator 1 is given charge of the locked box. The remaining five spectators mix the envelopes and each select an envelope of their choice and then sit in any one of the chairs. The selection of chairs is also a free choice. Spectator 1 tries to open the padlock with random combinations and fails to unlock the box. The performer explains that the lock requires a five-digit combination and the five numbers are in the envelopes. The seated five spectators now open their envelopes to remove a card. Each card has a single digit. They hold them up for all to see and/or call them out. The performer recaps there are hundreds of possible ways that the spectators could have arranged themselves and the numbers. That combination of numbers are now entered into the padlock in the order now displayed. The lock opens. The spectators have a totally free choice of envelopes and chairs. The envelopes and number cards could be kept by the spectators. Use any box which could contain a small gift for each participant. There is no memory work for the performer. No stooges. No magnets. No electronics. No forces. The performer never touches the envelopes, chairs, box or padlock during the performance. PsyLock was originally released in 2009 as a limited numbered edition of just 100 units and was priced at $160.00! It quickly sold out. This package does not include any of the props (lock, cards, envelopes) but gives you everything else to perform these routines including where to obtain the un-gimmicked lock and envelopes for a fraction of the original price.